What is art? Why does it matter to us? What does it tell us about ourselves? In his book Strange Tools. Art and Human Nature (Hill and Wang, New York, 2015), the philosopher Alva Noë tries to answer these questions by proposing a philosophical theory that investigates the artistic practice and the aesthetic experience in relation to many other human activities. Noë’s main idea is that the artistic practice is a re-organizational practice by means of which we put on display and investigate several organizational activities of ours, such as dancing or making pictures. Investigating our practices, art investigates ourselves too. “Works of art put our making practices and our tendency to rely on what we make, and so also our practices of thinking and talking and making pictures, on display. Art puts us on display. Art unveils us to ourselves” (Noë 2015, 101). However, Strange Tools is not just a book on art and artistic practice. Indeed, dealing with these topics, the author addresses also some of the main topics of his previous production: the nature of perception and the enactive proposal, the nature of pictures and representations, the extended thesis about our minds and cognitive processes, the place of neurosciences in the study of the mind, and so on. 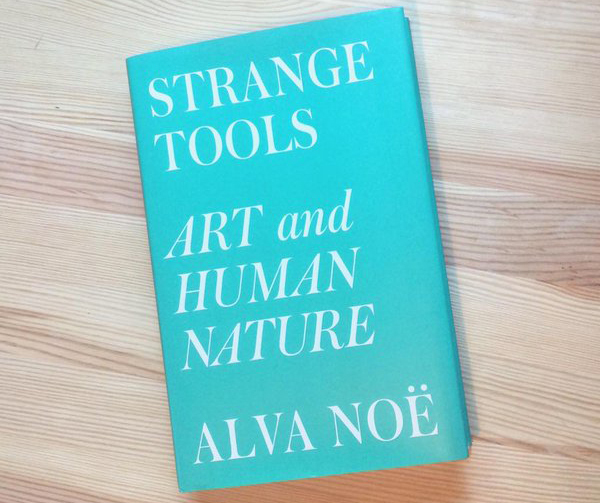 Researchers, on any of the topics addressed by Alva Noë’s Strange Tools. Art and Human Nature, as well as on any related topics addressed by the author in his previous works. Submissions on aesthetics and perception from other perspectives (e.g. theories different from Noë’s one) are also very welcome. What is perception? Can the enactive model be a good one to describe and explain how we perceive? Is the Extended Mind Thesis a tenable one? Should we think of a necessary limitation of such an extension? What is the nature of pictures and representations? What is art? How can we define the artistic practice and the works of art? Is Noë’s position on these topics embraceable? Can a neuro-aesthetic approach appropriately explain the aesthetic experience? In the negative case, should it be combined with other approaches or should it be completely rejected? notified by the 17th of April, 2017. Accepted papers will be selected for presentation and for publication in a related issue of Phenomenology and Mind. The story of how phenomenology infiltrated the French academic scene is a complicated one. The works of Nicolas Monseu and Christian DuPont have done an excellent job of beginning to trace this history, but there are still details of the story that remain elusive. To be clear, this was not Sartre’s first exposure to phenomenology. He had already learned of phenomenology via (at least) two of Husserl’s Freiburg students – Fernando Gerassi and Shūzō Kuki. But who had introduced Aron to phenomenology? 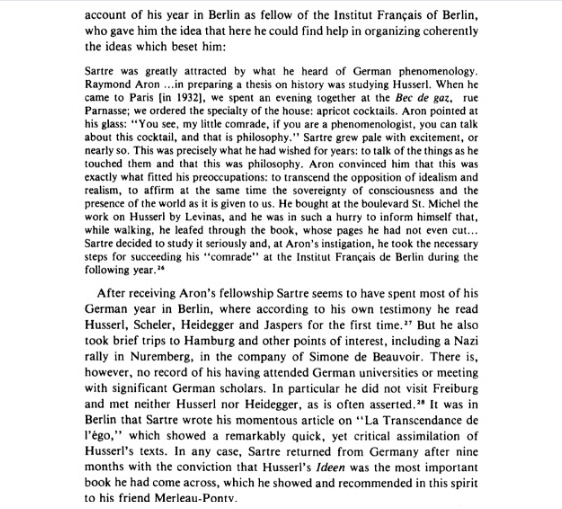 Was there someone at the Institut français de Berlin, or part of the Berlin academic scene, who might have steered Aron in this direction? Perhaps Bernard Groethuysen? And while Sartre was in Berlin the following year, did he visit with this same person? If you know the answers to these questions, please comment below. The Philosophy Department at IPFW, in association with the North American Society for Early Phenomenology, will host a workshop on phenomenological perspectives on negation. We invite abstract submissions on the topic of negation as approached through the phenomenological method, either with regard to scholarship on negation in the history of phenomenology or with regard to the topic of negation addressed from a phenomenological perspective in the context of problems such as consciousness, language, expression, socio-political philosophy, feminist theory, and axiology in general. The workshop will take place in conjunction with the Indiana Philosophical Association’s workshop on Negation. Papers accepted as part of the IPA Workshop will be presented on Friday, while papers accepted to the NASEP workshop will be presented Saturday. Abstracts should be 400-600 words, and include a short bibliography. Abstracts must be prepared for blind review and sent to Charlene Elsby (elsbyc@ipfw.edu). Deadline for submissions is February 15th, 2017. Decisions will be sent out no later than March 7st, 2017. CFP – NASEP 2017, Seattle. At the Origins of Phenomenology. Logic, Psychology, Ontology. At the Origins of Phenomenology. While the “phenomenological movement” is to be counted among the 20th century’s most influential traditions of thought, its roots lie in the late 19th century’s debates and discussions on both the nature and foundation of logic, psychology, and ontology, and of their mutual relations. This can be easily surmised by skimming the titles of the articles found in the Jahrbuch. During the early years of the phenomenological movement, many of Husserl’s students also studied with the psychologist G.E. Müller and the mathematician David Hilbert. Though Richard Courant refers to this time period as “Hilbert’s Göttingen”, it might be more accurately referred to as Hilbert-Husserl’s Göttingen. For there existed in Göttingen a cross section of interdisciplinary research that fueled discussions within both the Philosophische and Mathematische Gesellschaften, informed the work carried out in Müller’s experimental psychology laboratory, and which drew students from across Europe to Göttingen. Similar conceptual partnerships informed the phenomenological philosophy of the Munich Circle, as well as the projects of the Graz, Berlin, and Lwów–Warsaw Schools. The theme of this conference will be the role and position of phenomenology within the development of logic, psychology, and ontology, as well as its contributions to addressing, and eventually clarifying those disciplines. Topics would include the psychologism/logicism debate, the foundations of mathematics and logic, the nature of intentionality and of intentional objects, mereology, the relationships between psychology and phenomenology, logic and ontology, psychology and logic, and phenomenology and mathematics. In addition to those mentioned, we encourage papers addressing and discussing thinkers like Herbart, Bolzano, Lotze, Brentano, and Frege, as well as the impact of phenomenology on 20th century thinkers such as Kazimierz Ajdukiewicz, Hermann Weyl, Ludwig Binswanger, and others. As always, we welcome papers that deal with the full spectrum of early phenomenologists. Deadline for submissions is February 1st, 2017. Host: Philosophy Department, Seattle University. Why we support the Open Commons, and your society should too! Many of you have probably already seen on your social media feeds that the Open Commons of Phenomenology (who just happens to host our blog) has launched a crowdfunding campaign through Indiegogo. Their goal is to raise $35,000.00 USD over the next month in order to support their projects through to the end of 2017. If this model is successful, they can continue to provide their services in open access with the ongoing help of backers. Yesterday, NASEP contributed $600.00 to the campaign. And we think other phenomenological societies should do the same. For the average grad student or post-doc, a contribution of $20-40 is reasonable when they can afford it. For the average tenured professor, $85-100 seems to be the going rate for contributions. That also seems reasonable. But learned societies can play a much bigger role. And they ought to. NASEP is a young(ish) society with a tight budget and just a handful of dues paying members. But the decision to use some of our funds to support the Open Commons was an easy one. All of the executive members agreed that this was a worthy cause, and since we know our members use the Open Commons for their research, we decided to step up and give more than moral support. This is exactly what our resources should be going toward – promoting phenomenology and phenomenological research. The $600 contribution allows us to choose an author whose complete bibliography will be added to the Open Commons database. We chose Adolf Reinach for a couple of reasons. First, he was a member of both the Munich and Göttingen Circles of phenomenology, and was a central figure in the early phenomenological movement. Second, because of his untimely death, all of his works are in the public domain, which means that in addition to having his bibliography on the Open Commons, scans of all of his works will be added. We truly hope that this will inspire other societies that focus on phenomenology and related branches of philosophy to follow suit. With pooled resources, getting that $600.00 from a society shouldn’t be difficult. And it’s money that goes back into our philosophical communities. It’s an investment in our field of research. It’s an investment in preserving and sharing knowledge. And for those of us in positions of privilege, however slight, it’s a chance to assist our colleagues – both the team behind the Open Commons, and its users – in achieving their goals. Join us and contribute to the campaign by clicking here. The year 2016 marks the 100th anniversary of the publication of Scheler’s most influential philosophical work, Formalism in Ethics and Non-Formal Ethics of Values: a New Attempt Toward the Foundation of an Ethical Personalism. To celebrate this event, the Irish Philosophical Society and the German Max-Scheler-Society invite contributions which explore Scheler’s position in the philosophical and sociological context, as an interpreter, transmitter of and respondent to philosophical and sociological traditions, as interlocutor in the debates of his time, and as inspiration for subsequent and current philosophical and sociological debates. The goal is to draw attention to how Scheler is firmly rooted in and engaged with the philosophical and sociological tradition and to establish a dialogue between the scholars from within the Scheler research and the related disciplines. Interested participants are in addition invited to participate in short interviews concerning the work on impact of Max Scheler during the conference. The interviews will be cut to three short Max-Scheler films which will be made public on YouTube. These videos will conduce the international reception of Max Scheler in the Social Media. Conference papers may be presented in English or German. Notifications of acceptance may be expected no earlier than September 1, 2016. Presentations should be ca. 30 min, followed by 10-15 minutes discussion. Goal of the conference is the preparation of the first comprehensive companion to all important aspects of Scheler’s work and his standpoint comprehensively within the philosophical and sociological tradition. Speakers and other scholars are invited to submit their contributions for double blind peer-review for such a volume.